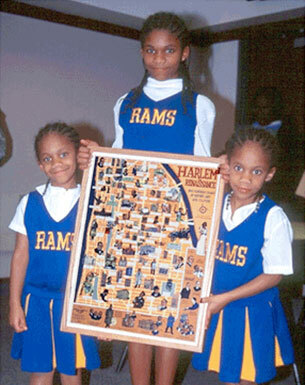 A framed copy of Ephemera Press's Harlem Renaissance Map was the grand prize when schools in Atlanta, Georgia competed in an African American History Month quiz bowl. Cheerleaders from the winning school, Dean Rusk Elementary, display their prize. Welcome to Ephemera Press, a publishing company devoted to celebrating the history of popular culture, the fine arts, and trends in politics through the visual power of fine illustration. 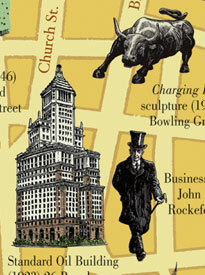 Ephemera Press is pleased to offer its series CultureMaps, illustrated map-poster-guides that explore the legendary neighborhoods of New York at the center of American history and culture. Each CultureMap explores a specific New York City neighborhood and features the homes and hangouts of artists, writers, musicians and other notables. The maps are illustrated by well-known artists and designed as wall posters. The back of each map contains a carefully researched walking tour. CultureMaps can be purchased folded, flat or framed. 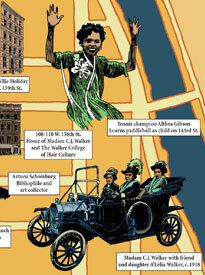 Our CultureMaps series has been the subject of numerous articles in the New York Times and other publications. You can read some of these reviews by visiting our Publicity page. 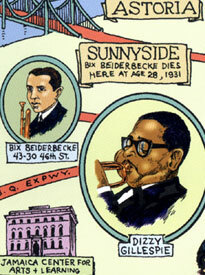 Ephemera Press's Harlem Renaissance Map has been approved by the New York Board of Education for use in intermediate and secondary schools. 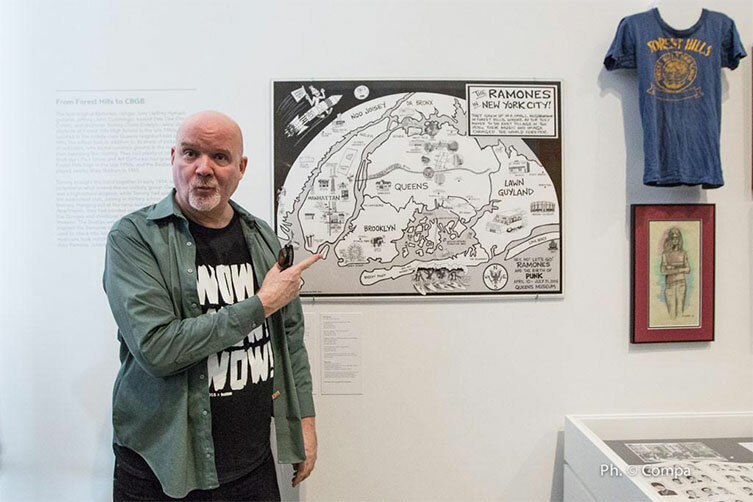 John Holmstrom with his cartoon map of the Ramones in New York City, on display at the Queens Museum. Photo by Andrea Compa. Ephemera Press recently collaborated with the Queens Museum on a map about the New York rock group Ramones, designed by John Holmstrom for the exhibition Hey! Ho! Let's Go! Ramones and the Birth of Punk. At its center is the New York City borough of Queens, with the four founding Ramones' childhood homes in the Forest Hills neighborhood, Forest Hills High School, and Rockaway Beach. 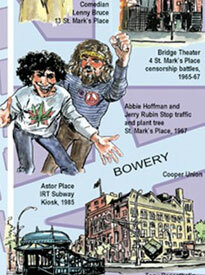 The map also extends into Manhattan, with CBGB and Radio City Music Hall (where the Ramones' first album was recorded). The Queens Museum displayed the map on its walls, and gave away copies to visitors. It is not available for purchase. The prolific cartoonist John Holmstrom was a co-founder of Punk magazine (1976–79), and contributed illustrations to two Ramones albums. His work has also appeared in the Village Voice, High Times, Spin, and Heavy Metal. His work was also recently used for the titles and special effects in the movie CBGB. His work is in the Rock & Roll Hall of Fame and the Beinecke Library at Yale University, which also houses his archives. 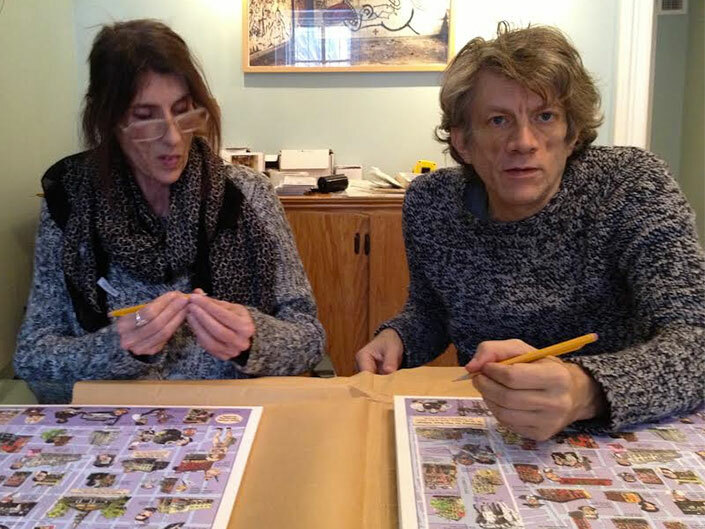 Ephemera Press is pleased to announce that artists James Romberger and Marguerite Van Cook recently signed one hundred copies of the poster version of the East Village map they created in collaboration with us in 2001. Featuring the homes and haunts of artists, musicians, writers and activists, the map is a tribute and guide to a neighborhood that had been an international center of creativity and bohemia since the 1940s. Learn more about the East Village map here. Signed copies of map are available at the Ephemera Press store. Romberger and Van Cook have long embodied the creative tradition of the East Village. James' pastels of East Village life are in the collection of the Metropolitan Museum of Art. Today James and Marguerite are probably best known for their work with artist David Wojnarowicz on Seven Miles a Second, an acclaimed comic-book autobiography written by Wojnarowicz shortly before his death from AIDS in 1992. In November 2014, Fantagraphics published Marguerite’s graphic memoir The Late Child and Other Animals, drawn by James. A visual journey through New York's art and music underground, as experienced by an artist, writer and curator living in the top floor loft at 98 Bowery from 1969–1989. The online store for the website 98bowery.com featuring original art and ephemera from 1975 to 1985 connected to the artist group COLAB, and the galleries Fashion Moda and ABC No Rio. Ephemera Exhibitions rents exhibitions and provides consulting services to museums, libraries and schools.